The home of Douglas and Monique. This photograph was taken after I spent 24 hours with Douglas and Monique in their living space, photographing and getting to know and understand them, listening to their stories of living on the streets, along with stories about how their life was before they were homeless. 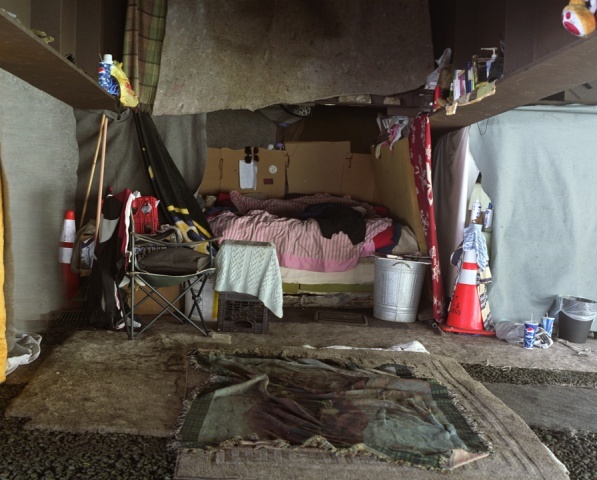 Just after New Years, in January of 2008, the city of Baltimore moved the encampment, people and belongings, from under the exit ramp bridge of Interstate 83 onto Guilford Avenue. The belongings were moved to a derelict homeless shelter and the people where moved to temporary housing. I was unable to locate Douglas and Monique after the move.